Are you bored? Then play Go Bananas! 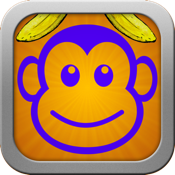 Move the monkey around to collect as many bananas as you can in 40 seconds. Look out! Try to avoid falling coconuts!!! Challenge your friends to see who can get the most bananas with Game Center. Are you better than your friends? Then try to beat the world's high score! Don't have wifi to connect to game center? Thats okay because Go Bananas! also has a built-in high score screen that keeps track of your five highest scores! Go bananas! has two modes; Time and Score. When in Time mode you have to avoid the coconuts for as long as you can and collect bananas to increase your score. In score mode you get 40 seconds to collect as many bananas as you can and try to avoid the coconuts so you don't get killed!